October 17, 2012 at 7:46 a.m.
A few more videos before signing off on our live coverage. This video shows a little bit of personality from the KU seniors as they flip through this year's KU media guide. In this video, I ask KU guard Elijah Johnson about his experience at Big 12 media days. All four seniors also wore their Big 12 championship rings, so I asked him if that was a coincidence. He says it was, but he's not very convincing. And finally, Travis Releford talks about his now-famous "Gangnam Style" dance that he performed at Late Night. Here it is if you haven't seen it yet, as the video is over 14,000 views on YouTube in less than a week. That's going to wrap up our live coverage from Big 12 media days. Thanks for being a part of it. Nick Krug just posted his photo gallery from Big 12 media days if you haven't seen it. Some good behind-the-scenes shots in there. Haven't put it in here yet, but be sure to check out Tom's blog about K-State coach Bruce Weber and his fake funeral at Illinois for Bill Self. Some interesting quotes in there from Weber about the situation and why he did what he did. I just uploaded a couple videos as well. The first is Self talking about what he believes was the key to winning the Big 12 eight straight years. You'll also want to check out this video, as Self talks glowingly about freshman Ben McLemore, saying the guard now has a new appreciation for learning because of last year ... the year he didn't play basketball. If you haven't seen it yet, KU is ranked No. 7 in the USA Today preseason coaches poll released today. When asked about the ranking, Self said he was surprised that KU was that high, but he added that his team would embrace the ranking. I stood at Bill Self's table for a half-hour — long enough to drop my recorder and have it shatter into three pieces before Self stopped in mid-question to say, "Nice hands, Jess." • Self said his teams benefited a lot from having Larry Brown around the program last year, even though he couldn't coach the players because of NCAA rules. There were times when Brown would tell Self, "I have an idea for you, though it might be a dumb idea." Self said he always listened to him when that happened. The players love Brown. • After being asked about perhaps going to the NBA sometime in the future, Self said. "I like my job. I like my job a lot." He later said he believes he has one of the "best jobs that basketball has to offer." • Self said he's changed as a coach over the years in that he's more understanding, he's more patient and he doesn't worry about things as much. He wants guys to show their personalities. Earlier in his career, he said some of the things that happened with Tyshawn Taylor last year off the court would have bothered him. Now, he realizes that's part of growing up. Self sees things more big picture and is more concerned about winning the war and not necessarily winning every battle. He also believes he's learned more about college kids and how to better interact with them. • Self believes AAU has a good impact on basketball. For the most part, there are good guys involved with it that give players exposure. Sometimes, things like AAU get a bad reputation, even if 97 percent of it is good and 3 percent of it is bad. • Self said, hypothetically, if he could get four one-and-done recruits in one year, he would take them. KU will always go after the high-end talent. He believes the perfect team, though, has a foundation of older guys with younger guys who are the most talented. Self said Kentucky coach John Calipari did a "remarkable" job at getting so many high-level players to buy into their roles last year to play as a team. • Self told his team before the year that he was going to take it as hard on them as any group he's had, but he said that's probably not true so far, because the guys try so hard. Self says his freshman have to perform at sophomore, junior and senior levels in the next month for KU to be successful. The biggest challenge for Self right now is to get his players to play hard and aggressive like he expects. • Regarding the 4-spot, Self said he's looking most for players "who can play the way I want them to play." Self said Kevin Young is ahead of everyone right now because of experience. Perry Ellis is a better scorer. Self is not looking at which players complement each other on the floor yet. He doesn't know enough about the potential level of play of guys like Ellis and Jamari Traylor to start looking further down the line at things like that. • Self said Young might be a better guy coming off the bench because he's an energy guy, but the coach isn't going to say that to him, because he's worked hard enough to start. • Even with his contract extension, Self says the pressure is still on, because if you're not successful, there are ways to get a coach out of a contract. That's the way it should be, Self says. The pressure should always be on. • Self said Travis Releford will graduate in December. The coach said Releford is the best player on the team at stealing extra possessions. "He's one of the most fun kids I've coached," Self said. "I love the guy." • Self said his old guys like the young guys, and the young guys are deferring to the old guys. That could change. Right now, the team is unselfish almost to a fault. Self gave the example that Ellis would be totally satisfied this year if Withey did well and had a great senior year. • Self said Withey has the skill set to average double figures in points. He benefited from Thomas Robinson offensively, but Self said people don't realize how much Robinson benefited last year from having Withey there. Self wants KU to play inside-out this year offensively, and Withey is a big reason for that. • Self said assistant Norm Roberts' years coaching at St. John's made him an even better coach. He's a basketball junkie. Self is amazed with the stuff that Roberts is doing in drills that has helped the Jayhawks' big men. • Self complimented KSU coach Bruce Weber, saying he took a team that Self left behind at Illinois and made it a better team than his staff would have, just because of the way Weber coached the players and because of the motion offense he implemented. One-on-ones begin right now with coaches and noon with players, so I'll be spending a lot of time over there in the next couple hours. I should be back for a post or two to keep you guys updated. Huggins says teams in the Big 12 have the best home-court advantage of any teams in the country. Some of the Big East teams play at arenas away from college campuses. For the Big 12, having arenas on campuses make a huge difference. Huggins said things have changed since he coached in the Big 12. At the time, the conference had north and south divisions when it came to scheduling. Huggins deadpanned that he didn't get to visit Lubbock, Texas, as K-State's coach in his one year, and he thought about sticking around another year just to visit there. Someone asked Huggins at Big 12 media day about his team's rival in the conference. He said he joked it was probably Iowa State, because it was closest to West Virginia — at only 853 air miles. Huggins said he thought about staying the night at Big 12 locations, but his players don't sleep much anyways. Plus, he said those guys sleep well on planes. He also jokingly asked if everyone else had noticed that college kids sleep better sitting down than they do laying down. Huggins said KU's eight-year Big 12 conference title run is amazing. Huggins said no one has a better home-court advantage than Kansas. He joked that his K-State team lost by about 106 when it went into the Fieldhouse during his one year there. He says Self does a great job. When you talk about who's responsible for that streak, it mostly should be him. West Virginia's Bob Huggins will be the final coach at the podium. Texas coach Rick Barnes said his team will start the season by going 11 players deep. At the end of his press conference, he joked with Matt Doherty, asking him how old he was. Barnes then talked about how he recruited Doherty to play for him earlier in his career, which is interesting, because both appear to be about the same age looks-wise. A quick Google search shows that Barnes is 58, while Doherty is 50. Baylor coach Scott Drew says his staff teaches both man defense and his 1-1-3 zone at the beginning of the year. Then, as the season goes along, he uses whichever gives his team the best chance to win. With his personnel this year, Drew said he could see his team playing more man defense this year. Bill Self's full transcript can be found through this link at ASAP Sports. Just posted the full audio from Bill Self's time at the podium, in case you want to hear the whole thing for yourself. Here are the Cliff's Notes from KU coach Bill Self at the podium here at Big 12 media days. • Self is excited about this year's team. It has some seniors and also "a lot of puppies." Self likes the possibilities of his team competing for another championship. • Last year, guard Ben McLemore spent a lot of the time in practice guarding Tyshawn Taylor. McLemore was long enough and athletic enough to give Taylor problems. Forward Jamari Traylor went against Thomas Robinson in practices. Self said Traylor held his own for about three out of five days against Robinson, and the other two days, he was beaten badly. Those practices helped both guys improve. They're picking up things quickly this year. • Depth was a factor for KU last year. KU went seven deep and not eight. This year, Self thinks KU can go 10 or 11 deep. Self thinks his team can shoot it better, but it doesn't have star power. The challenge will be to get the good players to step up and be excellent players and to get the blend players to step up and have greater roles. • An emphasis for KU has been helping Jeff Withey improve his offensive game. He's a good face-up, jump-shooter and an excellent free-throw shooter. He's good at scoring over his left shoulder, but he needs to learn to score over his right shoulder. KU assistant coach Norm Roberts is working with him every day. Scoring isn't natural for Withey. It doesn't come easy for him. Withey benefited a lot offensively from the defensive attention Robinson received last year. If Withey scores 12 points per game this year, that will show great improvement. Self is excited for him. • Self thinks the Big 12 reloads. He believes the league has just as many prospects this year as it did starting last year. The league won't take a step backwards. Last year, the Big 12 had three teams in the top 10 almost all season long, and Self would anticipate about thee same this year. • Self said KU's newcomers will make mistakes. Self's bigger concern is getting his seniors playing like seniors. Self thinks some nights KU will look really good, and other nights, the team won't look so good. Self is going to enjoy "getting there" with his team. • Self believes KU's run of eight straight Big 12 titles is a reflection of good players. It's a great source of pride for everybody in the program. The players don't want to be the team that doesn't win it. There might not be as much jubilation at KU for winning the conference title, because they believe it's their job. That's what they came to KU to do. • Self said that it was a great rule change to allow coaches access to players in the summer more often. Guys always do better when there's structure. The Europe trip was good for KU. The Jayhawks didn't perform well there, but that might be good, because they were humbled. Self hasn't heard one coach say that he disliked the new rule that allows coaches more access to players in the summer. KU coach Bill Self will be at the podium here shortly. I'll get up a Cliff's Notes version wrapping up his comments right after he wraps up. Shaw also says that a coaches' box has been added to the rulebook. Officials have told the referees to allow spontaneous reaction to calls. Officials can help coaches get under control after that. If the conduct continues, it's a technical foul. Jumping up and running down the sideline by a coach to dispute a call is a technical foul. Ripping off a suitcoat is a technical foul. Falling to the floor is a technical foul. "You're going to see a tougher enforcement," Shaw said. Shaw says if coordinators don't see officials calling technicals for the behavior above, those officials will be fined. That usually gets things changed. Big 12 coordinator of officials Curtis Shaw is talking now, and he's going through block/charge calls on some monitors. He says, all things equal, there should be more blocks called than charges in basketball. If calls are 50-50, officials are being told to default to a block call. TCU coach Trent Johnson just finished up at the podium. He said that now — following TCU's switch to the Big 12 conference — the kids in the Dallas/Fort Worth area know they will be playing in one of the premier basketball conferences in the nation if they join the Horned Frogs. He said players that choose TCU also will have to have a lot of courage, as those players will have to want to build a basketball tradition in Fort Worth, Texas. "It was difficult to follow him. He did a tremendous job at Illinois. The kids liked him, the fans liked him, and I had to get them sold that, hey, we'll be OK. We actually did pretty good. So it was a good run for us. Bill was truly missed there when he left. But we kind of got our own thing going. "Now, obviously, as one of the first questions John Currie asked me, my athletic director, when I interviewed. Why do you want to come here and deal with that? And I think as a coach, you want to compete against the best. Kansas, and running the Big 12 is amazing. 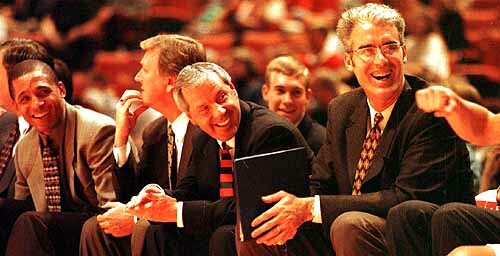 "Obviously, nationally the last three or four years Bill has been to the Final Four, runner up, won national champions. As a coach, you want that challenge. That's the exciting part of it. I hope we make it a rivalry. It's obviously a rivalry, but we hope we can compete and have a chance to really get them worried about us also. So it should be fun. He's done a great job, and hopefully we can compete with them." Iowa State coach Fred Hoiberg just finished up at the podium. He said his team had to play unconventional team last year with talented forward Royce White and a team without many ballhandlers. Hoiberg said, in many ways, it was a perfect team for White, because ISU had a lot of shooters that he could pass the ball to. White was ISU's biggest mismatch for opponents, so Hoiberg catered the offense around him. This year, ISU will play more conventionally with a true point guard in Michigan State transfer Korie Lucious. Hoiberg believes his team will be able to run more this year because of that. Oklahoma State coach Travis Ford says incoming freshman Marcus Smart (No. 10 in Rivals.com's rankings for class of 2012) can play four positions ... every position except for center. Ford has been especially impressed with Smart in practice, as the coach said the freshman is involved in every play. He's vocal, and Ford has never seen a player make more extra-effort plays. Ford said it's refreshing to have a player like that and says that's it's fun to watch him play every day. Our own Tom Keegan asked Weber which would be tougher: following Bill Self at Illinois or facing him in the Big 12. "It was difficult to follow him," Weber said. "He did a tremendous job at Illinois. The fans liked him. The kids liked him. I had to get them sold that things would be OK."
Weber said that while Self was missed, Illinois did get its own thing going under Weber. The KSU coach said one of the first questions posed to him in his interview with KSU athletic director John Currie was, "Why would you want to come here and deal with that?" Weber says he likes the challenge. He acknowledges KU's recent run in the Big 12 is "amazing." "I hope we make it a rivalry," Weber said. "It's obviously a rivalry, but we hope we can compete and have a chance to really get them worried about us also." Kansas State first-year coach Bruce Weber up now. He says his main focus was getting his upperclassmen, like guard Rodney McGruder, to buy in. "The thing I've done since I've took the job is focus on those guys," Weber said. "I want them to be successful." Walker says his team's biggest challenge is to get his players to believe they can win in Lubbock. He said looking at the Big 12 preseason coaches' poll (TTU is picked ninth) can get players down if they don't believe they can win. Walker wants to create a road mentality for his team all the time, because on the road, he says, teams have greater intensity and focus in on the goal. Walker commented that Texas Tech's players are even wearing their road black colors at today's event to signify the road mentality they hope to take. Walker should have quite a challenge this season, as he takes over for Billy Gillespie, who resigned last month. New Texas Tech coach Chris Walker is at the podium now. He seems excited to be here, showing some good energy while starting off his press conference by saying it was a great day to be a Red Raider. A familiar face in one of the front rows here, as former KU men's basketball assistant Matt Doherty has already asked Walker a couple questions. Doherty is here reporting for ESPNU. If you're just landing here, also be sure to also check out Gary Bedore's KU basketball story from today, which talks about KU's 2013 recruiting class being ranked No. 2 in the nation. Welcome to the Newell Post (early morning version) live from Big 12 men's basketball media days at Sprint Center in Kansas City, Mo. Kansas coach Bill Self will be sixth at the podium this morning at 9:45 a.m., but before that, the goal will be to keep you updated on what other conference coaches are saying. Surely a few of them will be asked about KU, which was the unanimous coaches' pick last week to win the conference this year. After Self talks at the podium, I'll also type up a Cliff's Notes version of what he says to keep you updated on the latest. I wanted to start the discussion with some interesting information I found in a report from the NCAA men's basketball rules committee meeting on a sheet of paper here by the media guides. The thing that caught my attention most was the committee "expressing concern regarding the number of incorrect block/charge calls, especially those called as charges which should have been, by rule, blocking fouls." • Before the offensive player (with the ball) becomes airborne, the defender must have two feet on the floor, be facing the opponent and be stationary to draw a charge. Otherwise it should be a blocking foul. • Secondary defenders (help defenders) moving forward and/or to the side are also in violation and these should be blocking fouls. • Contact that is "through the chest" is not de facto proof of a charge. The rule in its entirety must be considered before making a foul determination. • In some cases, it appears that a defender is being rewarded solely for being outside the arc, without considering the other aspects of the rules. At first glance, this seems like it could benefit some teams that don't take a lot of charges (like KU) and hurt others that have been known through rely on the defensive tactic (Duke and North Carolina). So what are your thoughts on the new rules? Keep checking back throughout the day for more Big 12 media day updates. The rule seems very complicated. I always assumed that the officials simply looked at the jersey and if it said DUKE, it was a charge on the other team. . . .
Haha Bruce Weber, the comedian! Calling more blocks will improve the game dramatically. Great question- Keegan! It is so ironic that K-State hired a guy who is most famous for being unable to emotionally deal with following Self. Now he has to try to compete with him head-to-head. Good luck with that, K-State! What I remember about Weber is he went to the NCAA Championship game with Self's recruits and then tanked from then on with his own recruits. I do like KSU and hope this works out well for them but I have some serious doubts. Jesse, I assume the times listed for PM are incorrect? Otherwise you are in for a long day! Ha. Yep. Thanks for the heads-up. Should be fixed now. I'm worried about Bruce - on many levels. On the basketball court is not one of those levels. His Illinois team finished in the top 40 in KenPom's rankings in seven of his nine years there and in the KenPom top 25 five times. Sometimes, I don't think he gets the credit he might deserve for being a pretty good coach. Right. But he's still easy to make fun of. ...said in the deepest, raspiest voice possible. Boy, I wanted badly for Marcus Smart to pick Crimson & Blue. He's going to be great for OSU. Let me get this straight, though, Smart can play PG, SG, SF, and C, but not PF? I find that a little puzzling, unless they've created a new position, like Wing or Combo Guard (which don't really count, in my book). Good point. Here's Ford's quote: "(He) can he play four different positions on the court from the point guard position to the two, to the three, to the four. If you asked him to play the five, he would do that too." The 5 is the center, so you are right. I changed it above. Not many teams play a true center, but technically, that's what the 5 position is. ahhh ok, I get ya. Sorry to nitpick. I'm glad they are fixing the charge/blocking call and only wish they done this before Tyshawn got here -- he got called for more charges than anyone. It was a weird situation where his superior athleticism was counting against him when really they should have been blocks, he was just too fast. And then it counts doubly against him as a TO and a foul. Luckily he did learn to vario his tempos and control his timing and pacing. Does Weber have any funerals planned? Other than his own on January 22 and February 11. And whatever date they cancel " GLEE ". Well, we win the Northern Iowa game if the charge rule is enforced the way it is going to be this year. Weber is doing great things for Kansas ST. Kansas ST. football team up to number 4, that shows a great coach is doing it again. Cracking down on bogus charge calls? Looks like Stevie Moore is even more useless now. Fantastic job as always. Keep it up! I love reading the quotes from Bill Self regarding this year's team. He is so down-to-earth and realistic in his expectations. He knows exactly what this team is capable of. "Jumping up and running down the sideline by a coach to dispute a call is a technical foul. Ripping off a suitcoat is a technical foul. Falling to the floor is a technical foul." Does that mean if this was the rule back in 2008, KU would have had a technical foul assessed to them at the end of the game when Self fell to his knees in the win over Davidson in the elite eight? or is the rule only in reference to a reaction to a foul called by the refs? It's only to dispute a call. Obviously, in that example, it would not be a 'T,' just as it wouldn't be a technical for Roy to throw his suitcoat when one of his players displays poor defense. Why are basketball coaches still wearing suitcoats anyway? They are in a sold-out gym (if playing Kansas) and it gets plenty warm. Football coaches were nice polos and are fine. It is just to have something demonstrative to thrown around during the game? I'd like to see all of the coaches wear uniforms like baseball. Huggins in warm-ups would be pretty funny. 3) I still want Louisville in the Big 12. I mean, Louisville is 16th in both polls and currently undefeated in football and their basketball program is currently preseason #1 in the country. Can nobody else seeing Louisvile/Kansas being an awesome rivalry in both football and basketball? Still would like to know where the Big 12 "Officially" sits with Louisville, Florida State, and Clemson? 4) There is always this debate about Calipari vs Self or Self vs Calipari and their programs. You know what, both styles and philosophies work. With that said, you really think Bill Self would trade EJ for Harrow, McLemore for Goodwin, Withey for Noels, or Ellis for Poythress? I don't think so! Just like Kentucky had the last couple of seasons with Liggins and Miller.................Kansas has with T-Relly and KY! ACC upped their buyout to $50 million after ND joined so FSU and Clemson are not options. Louisville won't be joining the Big 12 any time soon because of the way the football playoffs are set up. If the Big 12 does add more schools, it won't be until around the time the TV contract is up so in the 2023-2024 time frame otherwise there's just no point in adding more schools and making the pie smaller for each school. That I don't agree with, but to each their own. I know about the 50 million buy out clause but there is still a bunch of rumblings coming out of Florida State especially "How" that buyout clause came about. Florida State not very happy about it. One other thing................when lawyers get involved anything can happen. Did A&M, Colorado, Nebraska, or Missouri pay the full amount? No. All four schools together settled on about 1/3 of the total amount that they actually owed. Scott Drew confirmed that his coaching strategy for his guys mostly involves throwing money at them until they win. When asked if he though he would play more 1-3-1 D or Man-to-man D he responded, "I'm not much of a mathematician." If Weber wants K-State people to be successful...shouldn't he tell them to leave K-State? Did OSU talk about how they were going to survive without a 4'6" PG? KSU is not a rival...and with a name like the sunflower showdown, there never will be...i'm always embarrassed when they name it. Now the Border War, that actually sounds like a rivalry.